Dancing With Mrs Murphy is part of Citadel Arts Group’s “remembering the 1950s” project, and was written by one of their members, Vincent Maguire. Rose, the “Mrs Murphy” of the title, escaped from a life of poverty and disgrace in Ireland to come to live in Leith before the Second World War, and now, in 1956, she is on the brink of seeing her greatest dream fulfilled…or is she? The play explores the relationships between mothers and sons at a time of great social change. Both Rose Murphy and her employer, Mrs MacCarthy, who have come from very different backgrounds, have great ambitions for their sons, but in the course of one day in the MacCarthy household the lives of both families are altered drastically and many illusions are shattered. Laverne Edmonds (Rose Murphy), Debbie Cannon (Mrs MacCarthy) and Sean Fitzpatrick (Dan MacCarthy) all give extremely good performances in this dark drama, and the script is excellent, with many well-observed lines. My only negative comment on this performance is that the venue isn’t ideal; non-raked seating and a stage that is mainly at the same level as the seating makes it difficult for those seated further back to see fully what is happening on-stage. Having said that, however, much of the performance is dialogue-driven, so can still be enjoyed even with that restricted view. Leith is a little bit out of the way from most of the Fringe venues, but it’s definitely worth making the journey to see Dancing With Mrs Murphy. Beyond The Ash Lagoon: Susan Chaney (writer), Liz Hare (director). Nan and Rita and The Holy Grail: Carolyn Lincoln (writer), Adam Tomkins (director). Field of Opportunity: Jim Brown (writer), Liz Hare (director). All: Stewart Emm (sound design), Allan Rhynas (lighting). Flier by Eric Robinson. Beyond The Ash Lagoon: Audrey Jenkinson (Cat), Rachel Amey (Millie), Suzanne Dance (various), Adam Tomkins (various). Nan and Rita and The Holy Grail: Lynne Maccallum Hall (Nan), Estrid Barton (Rita). 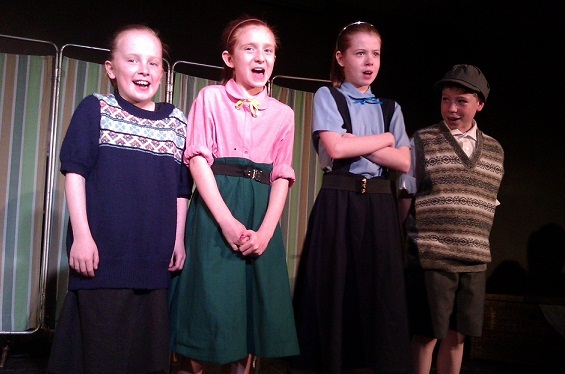 Field of Opportunity: Stephanie Falls (Bella), Megan Gamber (Jess), Ian Smith (Danny), Kirsty Strain (Mary & Holly Berry). Citadel Arts Group brings a triple-bill entitled Drama At The Dockers, performing for the ninth consecutive year at the lively, community-focused Leith Festival. Artistic Director Liz Hare has been leading the Workers’ Educational Association Playwrights Workshops, supporting members to share their stories and memories, unlock their creativity and develop their creative writing skills. 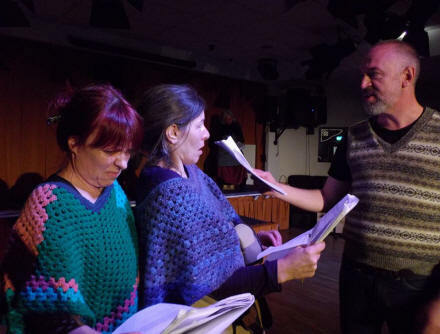 Emerging out of their latest programme are three very different scripts, performed as rehearsed readings over three days at the Leith Dockers Club. The first performance is Beyond The Ash Lagoon, written by Susan Chaney and directed by Liz Hare. Themes of grief and loss, and the layering of changes over time that impact on the landscape and the people within it, are explored through the relationship of two sisters. Now in their fifties, the two meet in a remote cottage in Cornwall in a place filled with memories of their childhood. One sister is trying to come to terms with the sudden death of her husband, but both find they have overwritten memories of the past with false narratives that need to be reconciled. Time shifts back and forth as the dialogue in the present is interspersed with flash-backs from the past. Others characters drift in and out, taking up the narration of past events, connecting and locking them firmly within the sense of this particular place that, like the two sisters, has undergone change and loss: the now-ruined tin mine, the all-but disappeared fishing industry. The narrative parts of the writing, with descriptions of the trees, gorse and bracken, the sounds of the sky and the sea, is vivid and lyrical and beautifully evoked by both Suzanne Dance and Adam Tomkins in their various roles. The dialogue between the two sisters is slick and punchy, played with humour and pathos by Audrey Jenkinson and Rachel Amy. This is a play with many layers, leaving the themes lingering in the air long after the actors have left the stage. The second performance, Nan and Rita and The Holy Grail, written by Carolyn Lincoln and directed Adam Tomkins, is a total contrast. A two-hander between Lynne Maccallum Hall (known to many from Still Game off the telly!) as Nan, and Estrid Barton as Rita, this is bawdy fun and frolics from start to finish. Opening in a supermarket café and finishing down the community centre, the two potty-mouthed OAPs gossip about their neighbours – one of them found the Holy Grail on the bus on the way back from Straiton, cue hilarious anecdote – and discuss cakes, love and lust. The two women match each other for laughs and nonsense all the way, in a riotous hour of pure entertainment that ends with them pulling blokes up on stage for a bit of a dance and passing round the nibbles, the music blaring, the party atmosphere complete. Finally there is Field of Opport unity, written by Jim Brown and again directed by Liz Hare. When teenage Jess escapes from London to see Auntie Bella, she gets more than she bargained for when she finds it’s tattie-picking season. For Jess and the other women it’s dirty, back-breaking work, but the days are also full of camaraderie and teasing banter, the evenings spent sharing whisky and memories. This is a strong cast, once again refreshingly dominated by female voices, with Kirsty Strain in particular showing great versatility as she switches between the seemingly strait-laced, moved-up-in-the-world Ms Berry and the raucous old crone Mary. The dialogue zips along and the occasional rousing tattie-song keeps the spirits aloft. The ending, however, felt like we’d left the story part-way through – perhaps there is more of this story to come? The Leith Dockers Club, as always, is the perfect venue for these play shorts. The audience is almost wholly local, genuinely engaged and warmly enthusiastic about seeing live theatre smack in the heart of their own communities. For those who did not manage to catch Drama At The Dockers, Citadel Arts Group will be performing Dancing With Mrs Murphy as part of the Edinburgh Fringe Festival this year, at the Leith Dockers Club from 13th to 16th August. 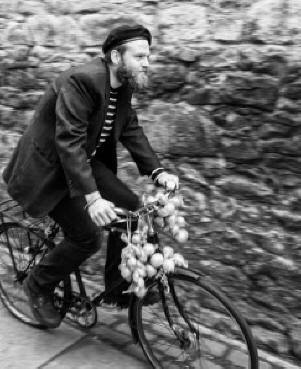 Citadel’s Leith Festival double bill, STORIES OF THE SEA offers ‘a braw bundle of insight’ writes Thom Dibdin is his FOUR STAR review in All Edinburgh Theatre.com. 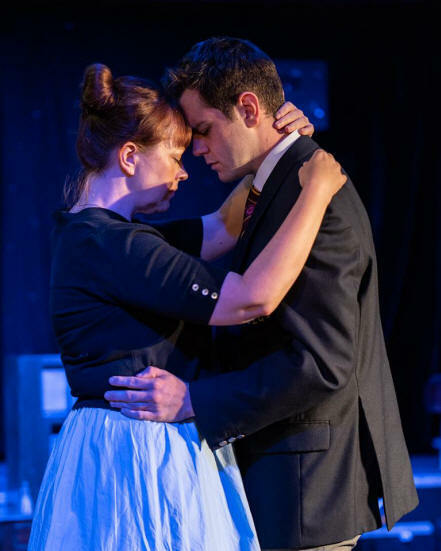 Another FOUR-STAR review from Justine Blundell in Edinburgh Guide.Com praised Andrea McKenzie’s ‘sweet sincerity’ as Eva, and Megan Fraser’s ‘feisty’ Lizzie in DAZZLE, a ‘genteelly engaging story’. While ‘WHIT ABOOT THE WIMMEN’ is ‘a delight from start to finish’: ‘funny, witty, smart’ and ‘brings unexpected tears to the eyes’. Citadel Arts Group thanks our sponsors: Weir Charitable Trust, random arts giving, Stafford Trust, Foyle Foundation, Leith Benevolent Association, Port of Leith Housing Association, and Forth Ports. The Weir Charitable Trust grant is enabling us to take a new version of both plays into centres for younger and older people after the summer. new base in Ocean Terminal. This gained a 4-star review from TV Bomb's Rob Peacock. Laure's play 'Leith Docks - A Way of Life' was based on living memories of people who shared their stories of the docks and Ingsn Johnnies. 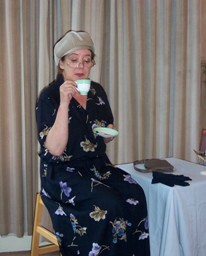 Alan Thomson's photo of Jennie Smith, whose memories of the Ingan Johnnies helped inspire Laure's play about Leith Docks. The 'Guid Doctor' was developed was developed from a reading in Ocean Terminal for an audience of local penshioners and Trinity Academy pupils. Eric, Nicky and Andy were members of the Photography Project, 'Face to Face with Leith', led by Kat Gollock. This was sponsored by Foundation Scotland.. The Story of Leith was a historical soundscape walk around Leith. 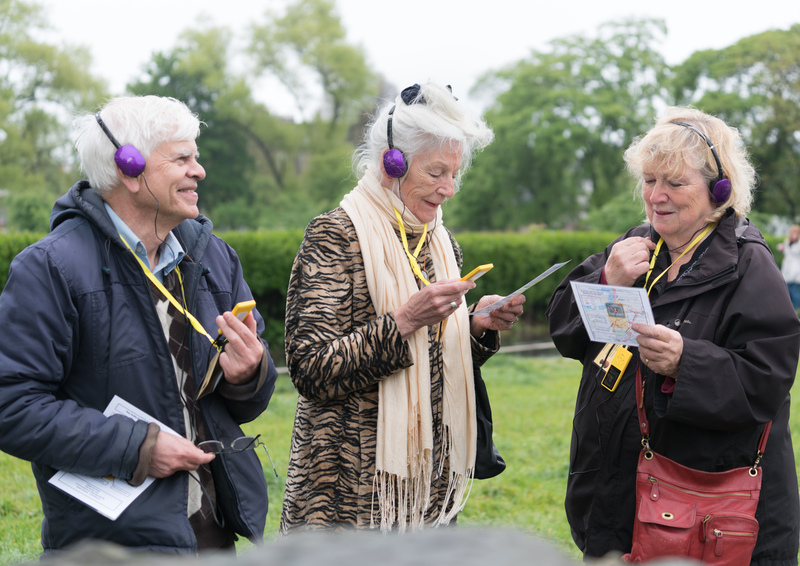 Through the use of binaural audio recording the walkers to experience an immersive audio experience of Leith's historic events. The scenes on the walk were researched and scripted by members of the WEA Playwrights Workshop led by Liz Hare. Voices: Mark Kydd, Helen Cuinn, Greg Davidson, Rob Flett, Derek McGhie and Andrea McKenzie. whose son died in the Gretna Train Disaster. 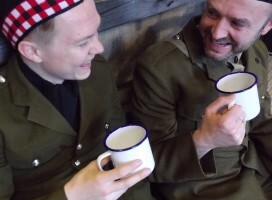 Reviews of "When the War Came Home"
It’s not often that I’m asked back to see a show, let alone because those involved have openly taken on some of the points I made in my review! I’m pleased to report that this totally revised version (which comes in at just under an hour – or less than the original production’s first half!) is now a narratively sharp, emotionally impactful drama which touches hearts and minds through its simple, yet effective use of music, song and reportage. When the War Came Home is a joint project by Edinburgh’s Citadel Arts Group and the WEA Playwrights Workshop, looking at how the realities of the First World War eventually “came home” to the people of Edinburgh and Leith – through the deaths of fathers and sons, the return of physically and psychologically-wounded soldiers, and the bombs dropped on the city from a singular German Zeppelin. The revised script offers a clear emotional continuity between the different women excellently portrayed by Andrea McKenzie. Rob Flett and Mark Kydd, meantime, remain the strong pillars of this small ensemble, embodying both the bravado and fear of men going to war. And Euan Bennet still impresses with his vocal and physical versatility, whether as none-too-bright newspaper seller Norrie or war poet Wilfred Owen. Regularly punctuated with period songs which are used to cutting effect. . . . I have to admit that John Lamb’s re-telling of the Zeppelin raid on Leith and Edinburgh now works perfectly as the dramatic core of the piece – the night, indeed, when “the War Came Home to us all”. It’s not often that I’m asked to give a show a second chance; it’s even rarer to see my concerns addressed and acted upon so diligently and effectively. The result is that the show’s obvious potential has been fantastically realised; I couldn’t be more pleased, and just hope that this won’t be its final run! Weaving poignant local vignettes into the horrific wider global context of the First World War, When The War Came Home, directed by Liz Hare, is a timely and moving depiction of the havoc wreaked by the Great War on the ordinary people of Edinburgh. It’s an ambitious and tricky production for small local company Citadel Arts Group to undertake, as action skips from families at home to soldiers abroad and back again in breathless fashion. One minute we’re in the office of (fictional) Evening News editor Iain Sutherland, the next in the Sarajevo where Gavrilo Princip is pledging an oath to South Slav nationalism before assassinating Archduke Franz Ferdinand. Another blink of an eye takes us to the Morningside parlour of a middle-aged couple whose son has just signed up for the Territorials. 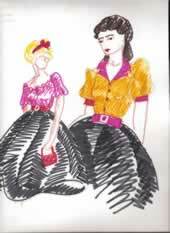 The cast of four are to be applauded just for the speed of costume changes and array of different voices paraded. We gain an impressionistic vision of life in wartime. Even those with a thorough knowledge of the War will marvel at the research that has been conducted and may even learn a thing or two. There’s detail about the 1916 Zeppelin raid on Edinburgh, the conscription rally by Sir George McRae in the Usher Hall, the pressure put on Hearts fans and players to sign up, all rendered with loving attention to period costume and props. What is more, all of this is set along national issues to help make the general personal. Most emotionally, we observe MPs debating in the Commons about the age of conscription, then see the effects of shell-shock on an under-age soldier, who only weeks before was an energetic newspaper-seller on George IV Bridge. The play’s chief appeal may be documentary rather than dramatic, but it’s none the worse for that, and it’s an impressive piece of work that fully justifies the contributions made by the community involved. 'A Night at the Pictures' by Cecilia Rose, directed by Karen Douglas - based on memories of the Loanhead Cinema in the 1950's. 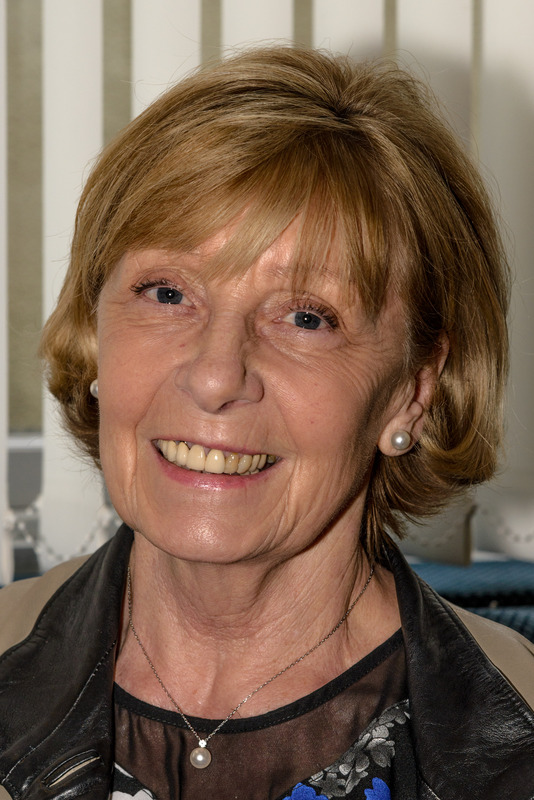 Laverne Edwards as the formidable chanteuse Mrs Brodie did not please Jimmy (Mark Kydd) and Gordon (Rob Flett). 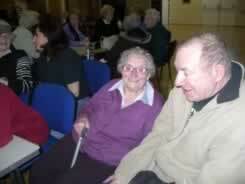 But she delighted an audience of older people in Dalkeith Welfare Hall on 12 March. The cast of "Leith at War" is Mark Kydd, Rob Flett, Angus Skakle, Andrea McKenzie. 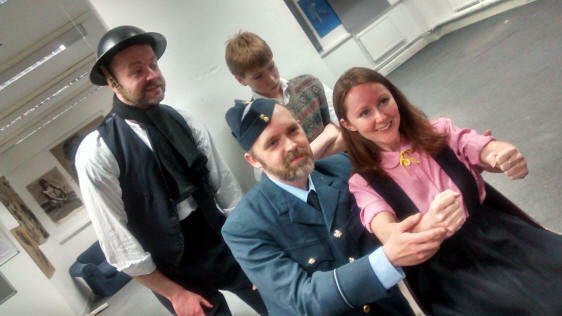 Leith at War' played to capacity audiences in Leith Hub. Thanks to our sponsors, Leith Benevolent Association, Foundation Scotland and especially Awards for All who supported the popular photo exhibition of Leith and Edinburgh at War, seen by around 120 people as well as the 250 people, mainly Leithers, who came to the show. Citadel Arts Group builds on emotions of torment of searching for family members and serving your country.Overall, the cast were incredibly strong, each bringing a sparkle to their characters. 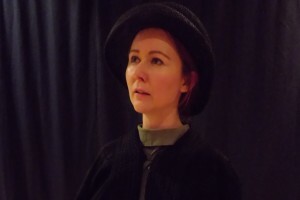 Andrea McKenzie as Frances shows the character’s maturing journey most clearly through two contrastingly performed letters written to her mother. . . .McKenzie also has a stunning singing voice that tugged at our heart strings. McScrooge in two Leith venues, Jamieson Place Sheltered Housing with an invited class from St Mary's Primary, and the Kirkgate Community Centre. Alan's take on a 'Christmas Carol' was a great success with young and old alike. 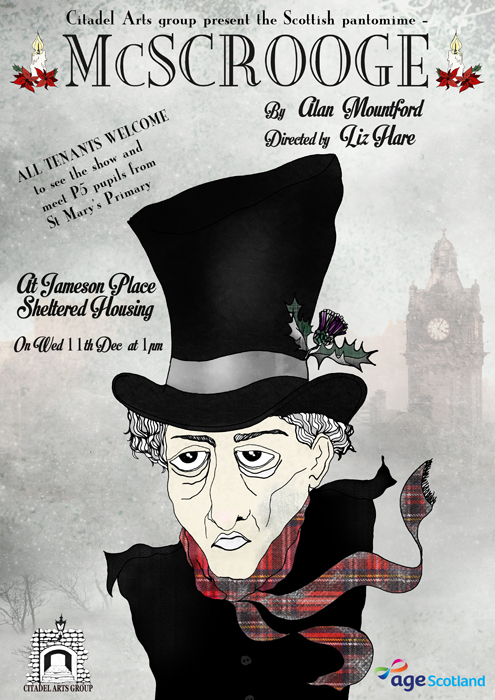 Robb Flett, played McCratchit, McMarley, all three ghosts and Moira McIntosh, Sarah Johnstone took on all the female roles and Mark Kydd as McScrooge. My Granny was a Rock Star written by Jim Brown and directed by Liz Hare, highlighted the importance of recycling and community responsibility. The cast of Andrea McKenzie (wee Donny), Iona Soper (her big sister Sandy) and Corinne Harris (Kath, the former rock star) raised laughter and tears in this heart-warming play. Junk Food Vampire written by Cecilia Rose and directed by Jemima Sinclair showed that good nourishing food might be the safest option! Four children are told to devise a play about healthy eating and all goes well until the masks that they wear start to take a life of their own. November 2012, Citadel was commissioned to develop a campaigning play for environmental charity, Changeworks. Jim Brown’s hard-hitting play, ‘Litter Louts are Losers’ tells the sad story of huge islands of plastic litter in our oceans and how three teenagers decide to get involved. 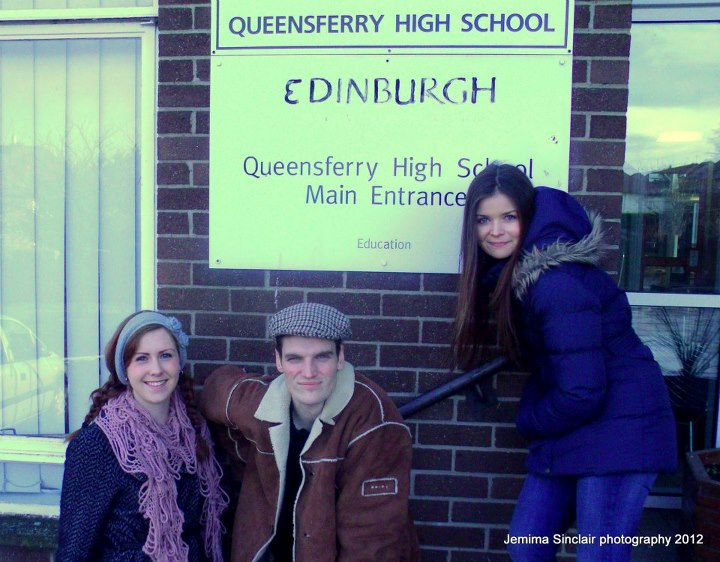 In December 2012, the play successfully toured round five Edinburgh High Schools: Craigmount, Holyrood, Queensferry, Portobello and Leith Academy . It proved a hit with the S1 and 2 pupils, one of whom called it, ‘minted’! 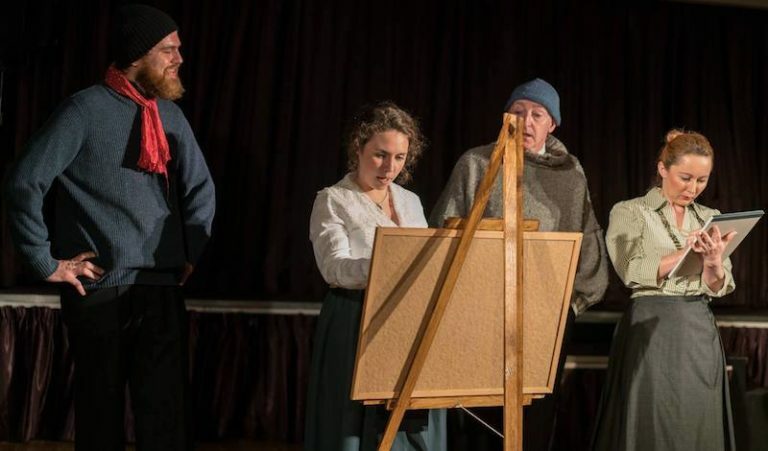 People Making Waves, our funder, invited Citadel to the Scottish Parliament on 31st Oct. We took part in a show case of the projects they funded, by staging the opening scenes of our Leith Hospital play by Laure C Paterson. Our cast of Nicky McCabe, Sharon Erskine and Stephanie Falls , alongside St Mary’s Primary pupils Danielle McDougall, Clare Hibbert, Kiera Fitzgerald and Angus Skakle, impressed an audience of MSPs and arts workers. Citadel’s Leith Hospital project at Leith Festival 2012 started on 11th June with an afternoon showing of Stewart Emm’s popular documentary film about Leith Hospital . This was followed by Millie Gray’s poignant and hilarious stories about the hospital. A capacity audience packed Leith Granary to enjoy an hour of nostalgia and humour which earned a 4 star review from The Evening News. 14 – 16TH June, ‘Leith’s Hidden Treasure’ by Laure C Paterson played to sell-out audiences in The Granary, on the Shore in Leith . 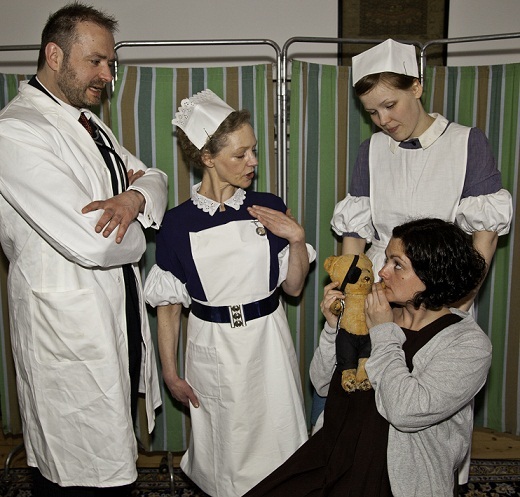 The play was based on living memories of the old Leith Hospital which Citadel had collected in the popular book, ‘Leith Hospital Recalled’. St Mary's pupils improvising their ideas for a play! The Project brought together pupils from P6 of St Mary's Primary School and the residents of Jameson Place Sheltered Housing in Leith. Jemina Sinclair led two drama workshops in the school to involve the young people in script development, and to perform in the show. 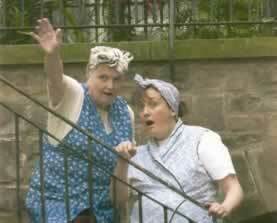 Karen Douglas and Nicky McCabe as Ma and wee Jimmy in Cecilia Rose’s Jimmy and the War Gold Rush. Ma (Caroline McKellar) and Pa (Ian Watt listen while Annie ( Nicky McCabe) reads a letter that came all the way from Scotland ! 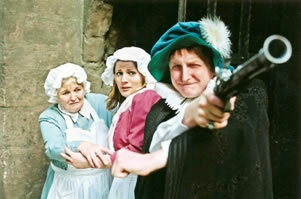 LEITH LIVES, was a triple bill of short plays, all inspired by different periods from the colourful history of Leith. The first piece, a new play, is Golden Leith or The Queen must Die by Alan Mountford. . 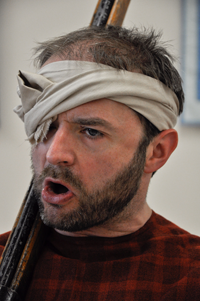 The playwright takes Tom, the rough English soldier from last year’s 4-star Siege of Leith Show, and brings him back to Leith in quest of the treasure that obsesses him. But Tom finds something very different. The show was funded by the Scottish Community Foundation and The Brian Souter Foundation as well as by Groves-Raine Architects, who are restoring the historic Lamb’s House, where Mary briefly stayed when she first landed. The other two Leith-based plays were the Gold Rush by Laure Paterson and Jimmy and the War by Cecilia Rose, both plays produced for the first time for a general audience. Gold Rush takes a 19th century Leith family across the ocean to seek their fortune in the California Gold Rush. 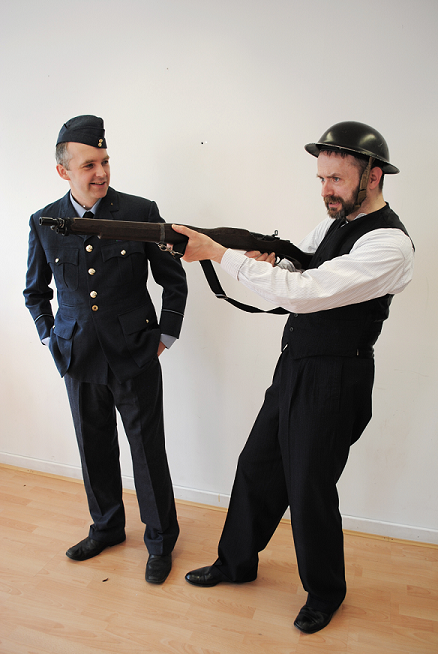 Jimmy and the War gives audiences a humorous glimpse into life in Leith on the Home Front during the War. 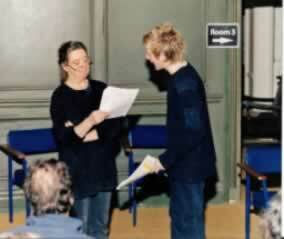 The plays were directed by Liz Hare and Mark Kydd. Leith Lives is a triple bill of new short plays by members of the Workers’ Educational Association, presented as part of the Leith Festival. All three the plays have some connection to the area, as do most of the people involved. The Queen Must Die, by Alan Mountford, is set in 1561, with the arrival of Mary Stuart at the Port of Leith. It is an intense tale of witchcraft and politics, war and love. Liz Hare directs this and the second play of the evening, Laure C Paterson’s Gold Rush, which sees a Leith fisher family making the journey to California with the hope of striking it rich. Although the story is a little contrived, the characters are very lovable, and the audience ends up rooting for this family. 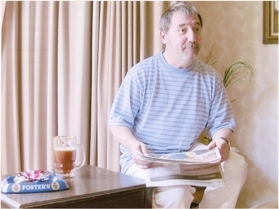 Ian Watt plays Billy Mac, whose stories have always inspired his daughter, played by Nickly McCabe. For a short play, the company manages to tell quite a large story, and although it might have benefited from a longer slot in the programme, it does succeed in its present form. The last play is called Jimmy and the War, and while Gold Rush creates the feeling it could expand into a longer piece, Jimmy and the War feels like part of something much bigger already. 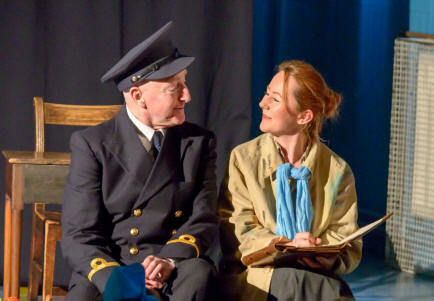 Cecilia Rose’s scene, directed by Mark Kydd, is set in Leith during World War II. Jimmy and his mum are doing their best to carry on while his father is away fighting. There is not a great deal of action in the scene, but the dialogue is deftly written. Nicky McCabe as Jimmy is simply irresistible: a lively, enthusiastic little boy who is aware of the war but far more upset about having to do his homework. It would be a pity if Rose does not complete the story in a longer play. This is a low-budget show, but all three the plays have the potential for bigger success. The Citadel Arts Group, funded by the Scottish Community Foundation, performed a triple bill of new plays during the Leith Festival at Duncan Place Resource Centre. "This show has been brilliantly produced by members of the WEA Playwright's Workshop. Each script is inspired by a different era in the colourful history of Leith, and without doubt, all of these three stage performances bring many of Leith's unique history alive. The opening performance on Saturday, June 11 was really well received by an audience that were easily able to identify with the Leith banter, humour and dialect. In addition to this, there were a few opportunities to burst into song during sessions of old time sing-alongs. 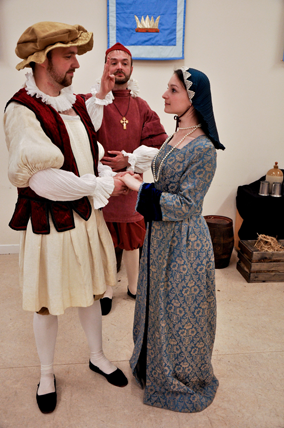 The first performance, directed by Liz Hare, The Queen Must Die by Alan Mountford, re-enacts the era of 1561 when Mary Queen of Scots' life is in jepoardy, as she arrives at the Port of Leith and dwells for a short stay at Lambs House, Leith. This performance uses minimal props and literally no set is used while the cast confidently capture the audience. A superb performance from Jemima Sinclair and Stephen Bennet, and especially Caroline MacKellar, Elek Kish and Torya Winters, who gave it their all in that moment with brilliant voice projection and passion. Gold Rush, by Laura C Paterson, also superbly directed by Liz Hare, portrays the period of 1849, where a poor working class Leith fisher family give up their tenement home to seek their fortune in California, and to their surprise, find the streets are clearly not paved in gold and end up living in a tent with "nae flares". Again Nicky McCabe easily grasps her character as loveable Annie, the daughter to mother and father Caroline MacKeller and Ian Watt. Caroline MacKellar brings her character to life with another great performance of a convincing character, assisted by her partner Ian Watt. The final performance, Jimmy and the War by Cecilia Rose, was directed by Mark Kydd. This colourful performance was staged in 1945 during the war and humorously portrays an account of family life during this era. Clearly, Hitler can't break the spirit of this one Leith laddie and his ma, beautifully performed by Karen Douglas and Nicky McCabe. Not only are the actors passionate about heir performance but they make very effort deliver themselves as true professionals on stage. This community based production is of high quality and further complimented by Laura Paterson's performance of tunes played on the violin. I believe the auditorium was filled with a feeling of all round nostalgia and great warmth and support for the performance of Leith Lives." of the events that ended the Auld Alliance between France and Scotland forever. The script linked Tudor days to the present by means of a time-travelling war correspondent, Malky McMorran from Leith FM. Malky travelled back to the past from 2025 to report on the siege, but when he found a lot more action than he bargained for, he found himself face to face with both royalty and regular folk and right in the middle of trouble. In advance of the performance our rehearsed script reading in Out of the Blue in Leith brought a capacity audience. Feedback was positive and we used it to reshape and refine the script. From this event we also recruited six local volunteers to help with the show - and several have stayed to work with Citadel in future productions. an absolute joy.’ He awarded the play four stars. playing live music. 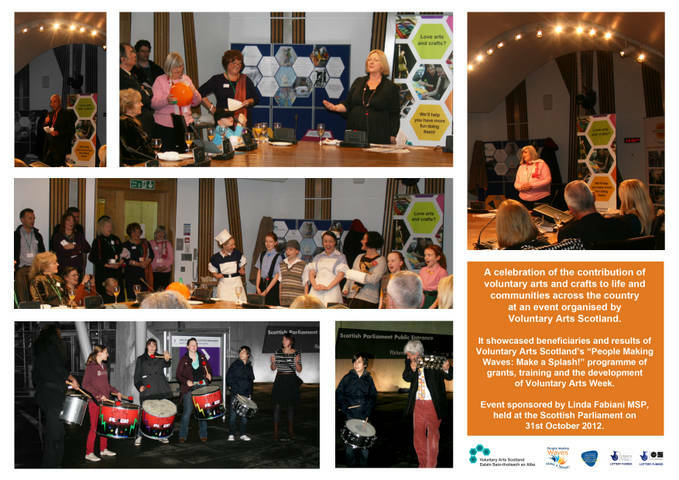 The production was funded by Awards for All and Leith Neighbourhood Partnership. Fire-raisers, sweethearts, doctors and daughters - the Scottish suffragettes changed the face of Scotland forever. A fast-moving revue - comic, tragic, touching and full of the songs and jokes of the era - takes you from the drawing-rooms of Morningside to the fields of Ypres in the struggle for women's suffrage. 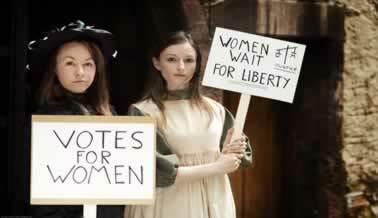 Police, prison sentences, force-feeding - nothing stopped the Scottish suffragettes. 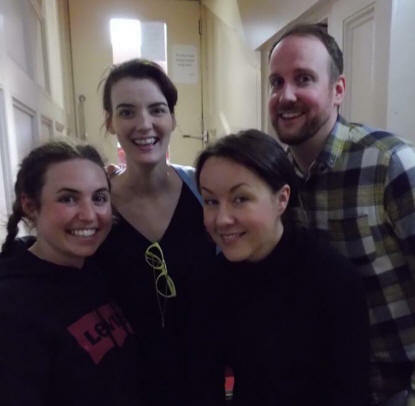 Cast: Stephanie Falls, Caroline MacKellar, Mairi Jayne Weir and Mark Kydd. 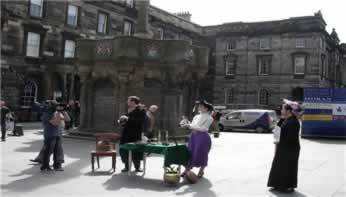 This play was part of the Gude Cause celebrations of 100 years since the big Edinburgh Suffrage March of October 1909. 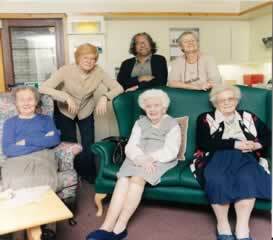 In October 2009 women�s groups from all over Scotland re-enacted the grand procession along much of the original route. Citadel Arts Group gratefully acknowledges the support and participation of our partner, the WEA who continue to fund the Playwrights Workshop. 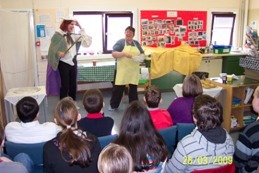 They were also supported a Costume Making workshop, tutored by Citadel's Wardrobe Mistress, Rebecca Roosman. The play project was sponsored from the Central Neighbourhood Partnership of the City of Edinburgh Council and UNISON. A mining family moves to Penicuik as war breaks out in Europe, and has to cope with new neighbours, daily work in mill and mine, rationing and blossoming romance. Light-hearted and full of singalong songs, the play was created from the living memories of elderly residents in the Pentland House residential care home, and performed in day care centres, local miners’ clubs, schools and residential homes. Feedback from local readings enabled Cecilia Rose to develop the script and make it a more authentic celebration of life around Penicuik before and during the war years. The Penicuik Play was the only Scottish project with vulnerable people in the community to be shortlisted for an award from supportactionnet. 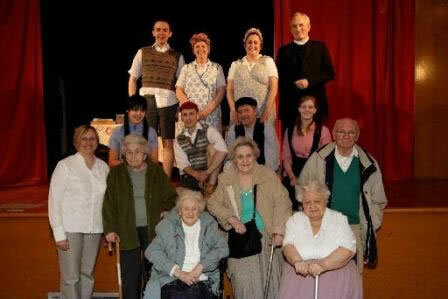 In September 2008 the complete script received a performed reading in costume as part of the Penicuik Arts Festival. Local people crowded the town hall for this popular community event. May Robinson meets the actor who played her character. 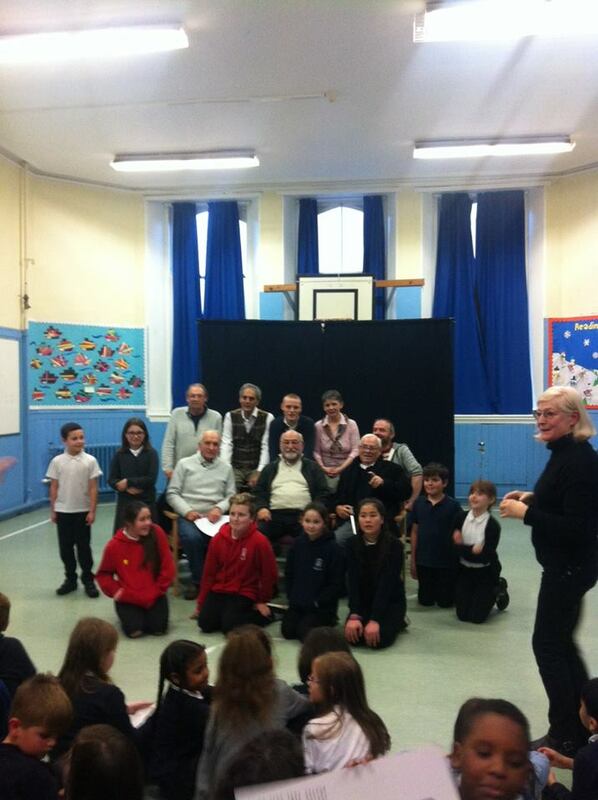 The Penicuik Play was generously supported by the Scottish Community Foundation and M.A.L.A.N.I. with further funding from Midlothian Council, Penicuik Community Council and Rotary Club. 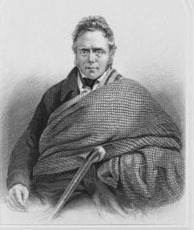 The eccentric and well-loved 'Ettrick Shepherd', poet James Hogg, reels and recites his way through the genteel parlours and seedy taverns of Edinburgh. On the way he creates bawdy, bold verse and stories, while rollicking through punch-ups with Victorian publishers. Using many of Hogg’s own words, this play was written using original materials from the National Library of Scotland. Cast: Catriona MacInnes, Nick Cheales and Elek Kish. A modern young Scotswoman risks her life to retrace the steps of John Hanning Speke, the playright's personal travels through the jungles of Africa, in quest of the truth about his journey to discover the source of the Nile. But we see Speke on the same journey in 1858, wrestling with hostile tribes, illness and betrayal, on the journey that riveted the Victorian public and rewrote African travel. The script was created from primary source materials in the National Library of Scotland and personal travels in Africa, and was given a performed reading with Elek Kish, Nick Cheales and Catriona MacInnesand Robert Camron in the National Library. "I was intrigued by Speke’s perseverance, optimism and courage" "A positive presentation of youth" "It brought back memories of my own travels"
These three plays, about family tensions, were performed for drama students in South Queensferry, in a variety of local youth centres and in the Royal High drama studio to cross-generational audiences. 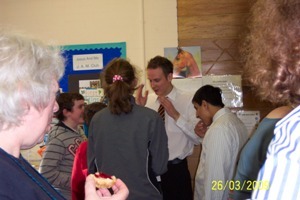 One pupil said:"I learned a lot about older people’s views on the story." Performed in Kirkliston Community Centre, this warm-hearted play about female friendship won the Edinburgh Writers’ Club’s one-act play award, adjudicated by Vicki Featherstone, Artistic Director of the National Theatre of Scotland. 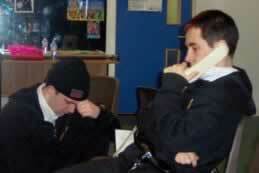 The performance before an older local audience, was filmed by members of a club for young people with challenging behaviour who meet in the local library. We workshopped Barbara Bryan’s monologue about drugs abuse in a unit for young people needing additional support to attend mainstream classes in South Queensferry High. The local police Youth Action Team praised Bryan’s realistic treatment of the effects of drugs: "A good forum for discussion." A pupil: "It really lets you see into a clubber’s life." This play was successfully developed with feedback from members of a youth club in Stoneyburn, West Lothian. Again the comments were full of praise: "Very funny..it helped me realise how important decisions can be…it sort of inspires you to do good by yourself." The project ended with a bang with two workshops lead by actor/playwright/director Susie Hardgraves of two of her own anarchic new plays. The scripts were given performed readings in the Royal High School with actors Patricia Cavanagh, Ian Smith and David Elliott. Susie used improvisation and student participation in two highly enjoyable workshops involving third and fifth year pupils, who voted the plays: ‘very funny. . .out of the ordinary. . . I liked the energy. . .intriguing. . . something different’. The actors who worked in this project were Pab Roberts, Patricia Cavanagh, Carrie Mancini, Robert Moore, Nathalie Bennett, David Elliot, Yvonne Briglmen, Danny Stoba, Ian Smith, Hazel Darwin-Edwards, Helen Belbin, Claire di Carlo, Rob Flett, Nathan Paul, Claire Grehan and Catriona MacInnes. The project was funded by Awards for All and the City of Edinburgh Council. After touring plays around mainstream schools, Citadel Arts Group moved onto developing short scripts suitable for young people with learning disabilities and special needs. This project was the brainchild of Yvonne Briglmen, who co-ordinated School T.I.S.E from the very start, when she and Robert Moore developed and performed Cecilia Rose’s script of Jimmy and the War in Saltersgate School, Midlothian. Live theatre is a rare commodity in special needs schools so the performance was welcomed with open arms: "this really brings historical subjects to life…encourages engagement….a great visual learning resource." Staff made a DVD of the show and a lively Q and A session followed afterwards. We were able to use this to market the play and apply for funding from City of Edinburgh Council and Leith Neighbourhood Partnership and the Voluntary Action Fund Community Chest to develop more plays. As well as Jimmy and the War, Bobby the Viking by Carolyn Lincoln and There’s Gold in Them Thar Hills by Laure C. Paterson were performed in a range of North Edinburgh venues including Pilrig Park School, Leith’s Acorn Centre, Pilmeny Youth Club and Rowanfield School. This project has been so successful that Yvonne Briglmen and Robert Moore have set up a separate theatre group to accommodate its demands. Scots lad Bobby comes home from school with a new personality – a helmeted and marauding Viking, who holds his patient mum hostage for scones. Full of colourful facts and details of Viking life and customs, the play was written as an educational tool for teaching history through drama in special needs schools. Cast: Ian Smith and Lynne Hall. In 1850s Leith, a fisherman’s family struggles to make ends meet. Dad dreams of a better life, but when the family board a clipper ship for the California Gold Rush their problems are just beginning. Panning for gold isn’t what it’s cracked up to be – but there are still plenty of fortunes to be made - even legally - in the Wild West. Cast: Mairi Jayne Weir, Caroline McKellar and Ian Watt. by Cecilia Rose. Developed and performed by Robert Moore and Yvonne Briglmen. A young boy and his mother keep their good humour despite sirens and air raids, serviceman Father’s absence in the war, and the rigours of rationing. The 1940s as it was lived in Scotland – with the timeless love of mother and son making it a message for now. Actors working on the School T.I.S.E. project were Yvonne Briglmen, Robert Moore, Ian Watt, Mairi Jayne Weir, Caroline McKellar, Ian Smith and Lyn Hall. In 2006, Citadel Arts Group brought a bit of magic into the lives of a lot of frail elderly people in residential care and day care centres. 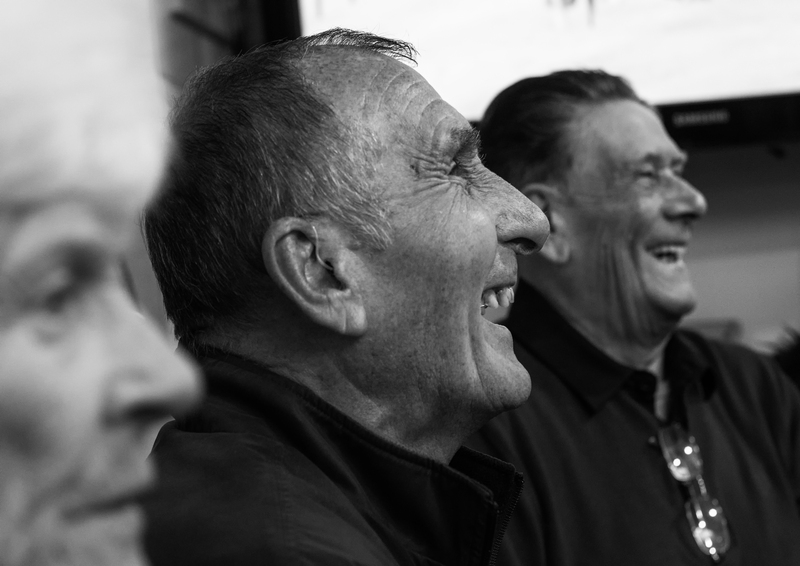 "I’ve never laughed so much… took me back to childhood days… loved it… please bring them back" said members of the over-50s club in the Muirhouse Millennium Centre. And these were typical responses when we performed Salute the Soldier by Rachel Yule, directed by Liz Hare, Ethel La Folle by Jim Mutch, directed by Nazli Tabatabai, Priorities and The Black Puddin' Club by Catherine McLachlan, directed by Liz Hare, Hide and Seek by Cecilia Rose, directed by Robert Moore and Rubbish! by Cecilia Rose, directed by Nazli Tabatabai. Script development was funded by Awards for All, and the City of Edinburgh Council, and the Scottish Community Foundation funded Citadel to offer these new plays around centres in South and North-West Edinburgh, from Burdiehouse Community Centre to the Haven in South Queensferry. 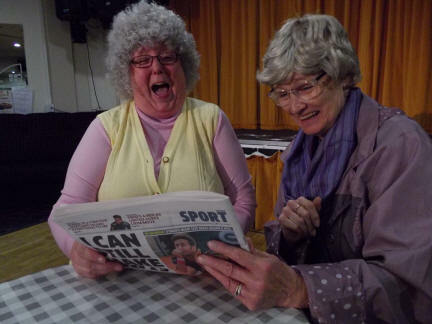 At the Pentland Community Centre Wednesday Club, Activities Co-ordinator Olga Ferguson wrote, "It was wonderful to see how they enjoyed your two short plays and one person even tried to join in with the actors." In an Oxgangs club for visually-impaired older people, after the show the cast and playwright chatted with the audience, who were keen to share wartime memories prompted by the play. The actors were Stanley Pattison, Yvonne Caddell, Lawrence Horton, Alexis Graham, Yvonne Briglmen, Rob Flett, Carrie Mancini, Ann Thomson, Robert Moore, Natalie Bennett and Catriona MacInnes. Citadel’s 2005 Fringe show explored the grim and colourful history of Riddle’s Court which was then threatened with closure. As the regular meeting place of the Workers’ Educational Association (WEA) Playwrights Workshop, who write most of our scripts, we felt a special bond with the close. So three of the playwrights group each wrote a short play based on events that occurred in the area. A comical look at the notorious Deacon Brodie and the myths surrounding his death. 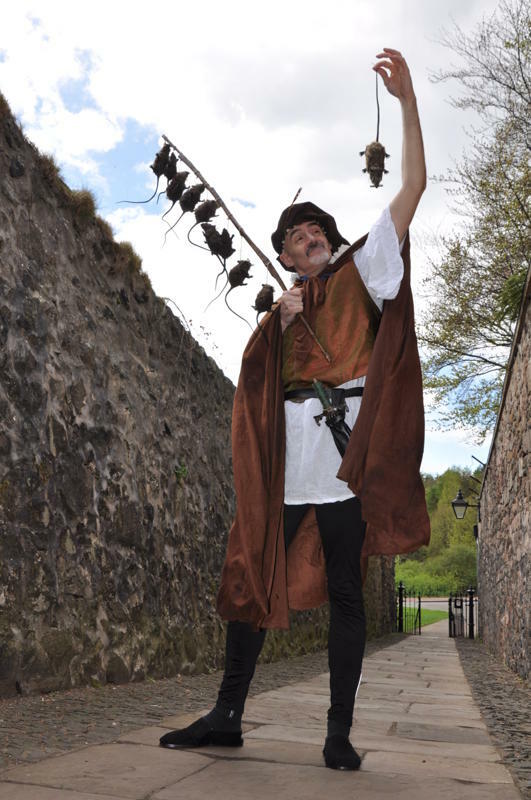 Did the Edinburgh worthy-turned-housebreaker really die on a gibbet designed by himself? Or did he cheat the hangman? Cast: Ann Thomson, Catriona MacInnes and Stanley Pattison. The most substantial piece, Gentlemen’s Bairns was a closely-researched historical drama written in authentic Jacobean Scots. It tells the story of Bailie MacMoran who built and lived in Riddle’s Court but met a violent end at the hands of the rioting pupils of the old Royal High School. Eric Roberston, Kenneth McColl, Rob Flett, Stanley Pattison, Philip Weddell, Bruce MacKenzie, Ann Thomson and Catriona MacInnes performed in this dark drama. The programme ended with a light -hearted glimpse of the ghosts that haunt the close. Cast: Bruce McKenzie, Eric Robertson and Philip Weddell. "some fine acting by Yvonne Briglmen and Ann Thomson... an engrossing mix... the focus on ordinary lives shines through"
In this play, an unfortunate passer-by is cornered by Mrs. Payne who loves to share her life. An elderly woman sitting alone in a café inspired this monologue. A one-man comedy which tells the tragic tale of Auntie Tittie, whose bid to establish a cultural salon in her Slateford tenement goes wildly wrong, and the chain of events by which a giant wheelie bin becomes the focal point of Edinburgh's top literary tour. A short piece based in wartime Leith. Two women meet in a park to share the news, but how far does their friendship go? The cast for Capital Cameos was: Yvonne Briglmen, Robert Camron, Ann Thomson and Margot Taylor. 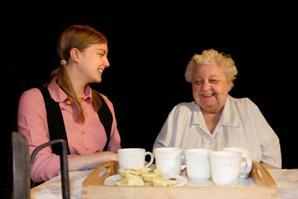 Citadel Arts Group has always believed that living memory is one of the most powerful inspirations for a playwright. In our 2003–4 project, we returned to our roots in Leith/North Edinburgh to develop and perform three new plays based on memories of local people. 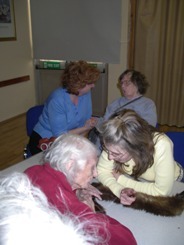 Story-telling and reminiscence sessions began in 2003, followed by rehearsed readings of early versions of the scripts, in Riddle’s Court, where playwrights Chris Deans, Peter Arnott and John Binnie gave feedback to the playwrights. Citadel’s co-founder, Millie Gray drew on her own dancing days in the 1950s Eldorado Ballroom to write On With the Dance, in which two young couples pair off. One of the lads is a squaddie just back from active service in the Korean War. 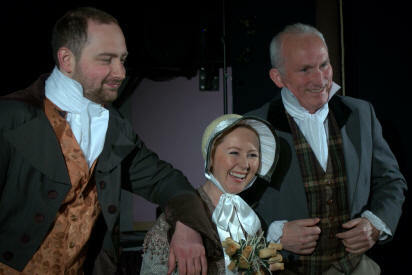 The cast included Russell Smith as the soldier, Stanley Pattison and Patricia Cavanagh and featured the dances of the period, making this a crowd-pleaser with local audiences in the North Edinburgh Arts Centre. The project also included Ann Stenhouse’s powerful family drama, Stain Remover, directed by Nazli Tabatabai, with Carrie Mancini as a working-class mother anxious to access education for her daughter (Amy Drysdale) - and for herself.To develop the script of The Father of the Man, playwright San Cassimally and director Liz Hare collected stories in Ferry Lee Residential Home in Leith. Out of these reminiscence sessions grew a moving play about a man also held back by a lack of opportunity and a few unfortunate marriages. The Evening News critic, Thom Dibdin, praised all three plays and speciall powerful performances by Robert Camron, Yvonne Briglmen and Catriona MacInnes. 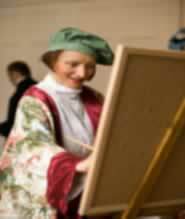 This project was funded by the Scottish Arts Council (Access and Participation grant) and the City of Edinburgh Council. 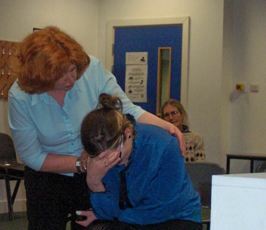 Citadel Arts Group were asked to perform Father of the Man to an appreciative audience at their Mental Health Promotion in Dublin Castle in April 2005.